Today’s inspiring reader story is by Adrianne, a stay-at-home mom who lives with her husband and three sons in Wasilla, Alaska. She recently started a blog where she shares recipes and stories about the joy of ordinary days after a battle with childhood cancer. If you’d like to submit your own real food story, you can do so here. When I first began cooking and preparing real food from scratch for my three little boys and husband, I had no idea how handy that new skill would eventually become. We made the switch in 2011 after watching Food Inc., like many other individuals. I’m a stay-at-home mom who already enjoyed cooking, so switching from cans of soup casseroles to fresh, real ingredients was a fun challenge. My twins were 4-years old and my littlest was 2, and it was the perfect time to swap processed crackers and snacks for fruit, homemade ice cream, and yogurts. Not only did we all feel better – my blood sugar stopped plummeting daily, regularity felt like a gift from Heaven, and I lost a few pounds – but my boys were learning to be adventurous eaters. Then in February 2013, we got the devastating news that one of the twins, then 5, had leukemia. With three and a half years of chemo in front of us, I knew the only thing I could “do” was to feed my son well. When he craved comfort food, I had childhood favorites “real-foodified” at the ready and in our freezer. When he had no appetite, I had nutrient-dense soups and smoothies for him to sip all day long. Even PB&J was beneficial with peanut-only peanut butter, homemade jam, and fresh whole wheat bread. Every evening I would take an hour and make overnight slow-cooker broth, muffins and quick breads, smoothie pops, and homemade coffee creamer to treat tired parents. I won’t lie, it was tiring during hospital weeks, but it mattered so much to me. We all benefited from eating real food made with love. Since we live in Alaska, there is no Whole Foods, there is no Trader Joe’s, there is no year-round gardening or year-round farmers’ markets. I had to be creative and thoughtful about sourcing high-quality ingredients without breaking our very tight budget. Planning ahead, stashing even the smallest leftovers in my freezer, and giving myself a little grace when the end of a long week resulted in take-out helped keep my family strong during the longest years of our lives. My son finished chemo in April of 2016 and is strong and healthy and beautiful. I can’t ignore what an important part real food played in his strength as we asked his already growing body to take on a war. The boys also take a huge amount of pride in knowing they have a taste for high-quality homemade food. Given that they attend school outside the home, I know they will have birthday cupcakes, fruit roll-ups from friends at lunch, and “fun food” at numerous school parties. I’ve learned that it’s what is fed at home that makes the biggest difference in their attitude toward nutrition and I won’t rob them of the learning experiences that come with eating “sometimes foods.” They can forget they have leftover Halloween party candy in the pantry if I just don’t make a big deal about it. Real food has become a part of who my family is and we’re always looking forward to the next thing we can make “better!” Most importantly, we’re always looking to encourage and share real food with families on the same path unfortunately caring for loved ones battling illness. My youngest son was diagnosed with leukemia in March 2012 at age 7. My “real food” journey began in the midst of his cancer treatment and I too believe it has helped him thrive and grow stronger. I’m so thankful that I have this knowledge and can put it to use. It’s a journey that I plan to continue trekking on and look forward to being able to have a garden and chickens when we relocate this summer. So happy to see your son is doing well, thank you for sharing your story. This just made me cry very early in the morning. Our daughter was diagnosed right after her 3rd birthday and it was during her treatment I started to make changes. It does take more effort but it is so worth it. I applaud your strength for being able to take on such changes in the MIDST of treatment. 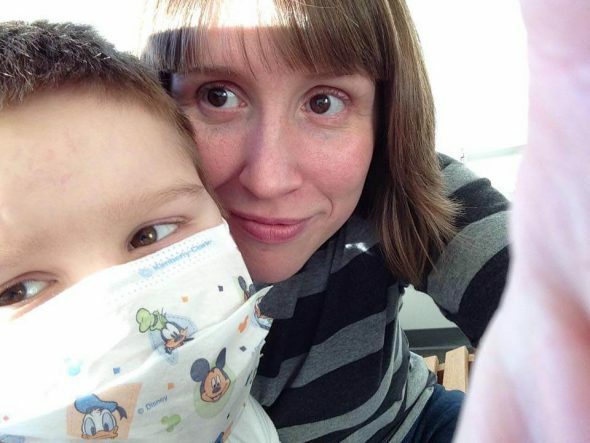 What beautiful dedication to your kiddo :) When you are faced with that black hole of diagnosis, you recognize how the simple act of feeding your child is not just “housework,” but a deeply loving act of humanity. I am also the proud mother of a leukemia warrior, my son also 5 and a twin was diagnosed in February of 2015. We are still in the middle of our fight but he is doing awesome. Thank you so much for your post today, it is a great reminder that I can do this and feed my family well even in the middle of struggles. Many blessings! February is our month, too :) You CAN do this. And you will not do it perfectly and you will second guess yourself a lot. I had to come to accept that it is my job to love him, not fix him. And it sounds like you are doing a beautiful job at that. The world is blessed by you sharing your story here and by all the love you have shown your children through this journey. Thanks for being such a devoted mom. Thanks for sharing this story. Reminds me to continue to be thankful for where I am. My daughter is a neuroblastoma survivor and stories like this still hit me in a very deep place. She was 20 months old when diagnosed. She is now turning 12 next month. So grateful to have her with us. Much love and support to all of the families who have fought the fight and to those still fighting! What an encouraging story! I understand what you mean about being hit very deeply by other people’s experiences. You can never hear enough victorious stories about cancer survivors! I’ve been blessed and encouraged to read your story as well as all the replies. Thank you for sharing! Your story was very encouraging to read. Thank you for sharing. We have 4 daughters and our fourth was diagnosed with a rare genetic disorder at birth, Aicardi Syndrome. She is now 3 and every day is a challenge with all her extra needs. I have been wanting to feed my family “real food” but I do not know where to start. It feels very overwhelming. Do you have any suggestions? Baby steps? Thanks! It helped us to start with things we already knew we liked, like pizza, ice cream, and smoothies. Then we swapped over things that required no cooking, like peanut butter and dairy products. Just start with the things you’d be excited to try and swap and build from that :) Keeping it fun was an important factor for us!